Although I feel a bit too grown-up now for high school dramas, I thought I'd give Dream High a try due to the heavily positive reviews online, and because the cast was interesting (I enjoyed Taecyeon in Cinderella's Sister as well as Ham Eun Jung in Coffee House). I ultimately feel that it wasn't my sort of drama, but I can appreciate certain aspects about it. 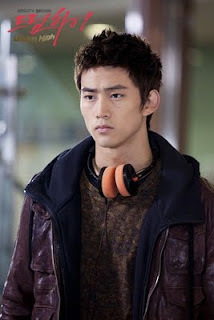 The music is pretty good and very addicting (I like the Dream High theme song), the characters are very pretty if not all convincing, and the story breaks out of the kdrama norm in several respects, notably via the female lead's unlikeable personality at the beginning and the departure from the first-love-is-forever type of storyline. However, the story failed to entrench me and I found myself quite critical of its many plot holes and bad acting. I watched this in parts, as I never cared enough to continue watching long after any single episode. Thus, I've correspondingly reviewed the episodes in groups that generally reflect when I watched them. Each section contains my thoughts at the time of viewing. The beginning honestly didn't grip me as much as I'd hoped after reading the hyped reviews for the series. While I found Hye-mi's intentionally dislikable character to be a breath of fresh air from the typical candy-sweet and innocent kdrama heroes, the plot, acting, and overall character development were significantly lacking. First, the forced rivalry between Hye-mi and Baek-hee was presented in an extremely rushed and frankly unrealistic manner. Certainly, girls can often go from friends to rivals due to jealousy and other clashes (I've had personal experience with this), but in this show Baek-hee literally transforms from a naive, sweet, and loyal follower/bff to a slitted-eyed, passive-aggressive, vengeful lifelong rival in the blink of an eye. This would be fine if we had any former indication that Baek-hee possessed any secret envy or buried dislike for Hye-mi, but this was never revealed to be the case; she even happily states how she likes being called "Hye-mi's follower." It therefore seemed to be the writer's intention to make Baek-hee a genuinely innocent and pure character. Yet if that's the case, it becomes almost impossible to buy the minute-span change from angel to devil, regardless of how bitchy Hye-mi was to her. Perhaps a hurt, sad character would have resulted, but realistically not such an openly spiteful one. Especially later on, when Hye-mi's familial state is revealed and her motives understood by Baek-hee; rather than forgiveness as one would expect from a true friend, it only sets off continued hatred and rivalry. One example of a well-done transformation can be seen in the first four episodes of Cinderella's Sister, as our Cinderella goes from bubbly, genuine character to evil, hateful one. Next are the two guys. They're definitely pretty to look at, but lack a certain oomph that I enjoy in my male stars. Taecyeon was one of my favorite parts of Cinderella's Sister, but somehow lacks any strong appeal in this series. His acting is his obvious weakness, as I simply don't buy much sincerity from any of his chivalrous motions. I mean, I don't even speak Korean and I thought his delivery/line recital was terribly robotic, paired with his stiff facial expressions. His character is also highly stereotypical- pretty, misunderstood boy who miraculously recognizes the girl to be from some childhood first love encounter. Sam-dong is appealing in the sense of his departure from the norm, but frankly not in a romantic sense for me at this point. Hye-mi's potential romance with both seems rather shallow and unreasonable- they're in love with her memory and appearance respectively, which doesn't seem like much to build a true relationship on. Lastly, that whole pendant storyline. SOOOO RIDICULOUS AND CHEESY. As if there weren't enough random, unrealistic scenes (aka sudden bar glam singer excuse for dress-up part). It's so awkwardly fake that everyone seems to regard the pendant as a true source of good luck and make it seem like Hye-mi killed someone when it's discovered that she had it. I mean honestly, not one person had the sense to say "hey it might just be a coincidence" or "hey it might just be in your head" with regards to the good luck factor? Maybe I'm just getting too old for outlandish and essentially useless plot devices. Definitely a noticeable improvement in terms of plot progress and acting. However, the drama still has a rather needless flair for the dramatic, such as Sam-dong's mom fainting upon the bad news. Like seriously? Are all people over 40 in kdramas on the brink of a hospital condition upon the slightest disturbance? Truthfully, no matter how great people say the drama is, there's simply something that fails to addict me to this. I think it's relatable characters- nobody is in a situation that I can entirely sympathize with, and this takes away a large amount of story strength for me. It doesn't help that the acting often fails to convey the depth of tragedy to their backgrounds and situations. I know I should be happy when one character succeeds at something, but all I feel is indifference. I give up. Not watching any more. I already know how it ends anyways. Overall, Dream High was a bit like Shining Inheritance for me - I see its appeal and desperately want to be drawn into it but never quite succeed. For SI it was a motley of factors - Lee Seung-Gi does nothing for me in terms of appeal, Han Hyo-Joo wasn't that relatable, and the political family drama overweighted the story. For Dream High, neither of the two male leads appealed to me (even if they were both pretty), Hye-mi was pretty flat throughout, and I'm not enough of a rap/music/dance fan to appreciate the every-15-minutes MV stuff they stick in. Those who love musicals or are actually in high school would maybe enjoy this. For me, I think I'm going to forever let go of the teenage-angst-and-love type of story.